The introduction of the ‘Live Inside and Win the Ride’ (LIWTR) competition by Global media Alliance Broadcast Company, operators of YFM, Happy FM and e.TV has succeeded in transforming and remoulding the face of reality shows in Ghana because of its unique nature and the fact that it has not been tried in the sub-region before. The concept behind the LIWTR reality show is to bring together five individuals from different backgrounds across the country to endure sitting together in a five-sitter Renault Logan saloon car for a period of up to 40 days. Along that period, contestants were evicted till there was one left. The ‘last man standing’ walked away with the ride. But to emerge winner, all contestants had to be tolerant, time conscious, cunning and most of all strategic to torment – without abusing – fellow contestants in order to get them out of the running. As part of the rules of the competition, contestants have a 15 minute break every 3 hours during which they can do whatever they want. They are also allowed 2 hours on their phones per day. Based on these rules, a contestant faces eviction for lateness after breaks as well as abusing fellow contestants. A contestant may also voluntarily leave the car due to their inability to cope with the other car mates. A brand new Renault Logan salon car housing the contestants was parked within the foyer of the West Hills Mall at Weija for the 40-day contest. Ghana’s first Live Inside the Ride competition started with Abdul Malik Jaberl, Setor Jinadu, Vittor Faustinus Komla, Sarah Ayim and Ernestina Fiah on March 7, a day after Independence Day and ended on April 15 at the West Hills Mall, Weija with one contestant pulling a surprise on all patrons to emerge winner of the show. On the first day of the LIWTR, retired security officer Vittor Faustinus Komla, the oldest contestant, suffered a premature eviction for not reporting on time after a break. The 61-year-old who was 10 seconds late after the first allocated 15-minute break in the competition, attributed his lateness to his failure to find his way back to the car at the West Hills Mall which cost him his chance of driving home the brand new Renault Logan. He lasted less than 24 hours in the captivating reality show which caused several of his fans to start a social media campaign to bring him back, but to no avail. Abdul Malik Jaberl, a 27-year-old entrepreneur, was also disqualified after he brought an ‘unhygienic’ item into the car. He was kicked out of the competition after an investigation found him guilty of placing the ‘unhygienic’ substance in the car, an act which according to organizers was against the rules of the competition. The disqualification and eviction brought the number of constants to three – Setor Jinadu, Sarah Ayim and Ernestina Fiah- remaining in the Renault Logan car, each hoping to emerge the ultimate winner of the 40-day competition. Setor Jinadu, one of the three finalists in ‘Live Inside and Win the Ride’ reality show vowed to kick out contestant Sarah Ayim from the competition but he failed to accomplish that. Setor, junior brother of Coded of hiplife trio 4x4 and considered by patrons of the event as the ‘bad boy’ of the completion had since day one pulled various stunts to make the other contestants very uncomfortable. His main target had been 23-year-old model, Sarah Ayim. The young model, who carved a niche for himself as the troublemaker of the reality show, pulled several stunts to make the other contestants as uncomfortable as possible. He targeted to kick out the two ladies by resulting to sleep naked in the ride during their 40-days stay in the car. “If I don’t know how to drive, my brother wouldn’t leave his car for me. When I am going out (with a car), they (family members) give me a strong warning not to mess up (with the car). Annoyance is the most important part of this contest. You need to work on your temperament to fit in this contest and I started with a bad temperament. My temperament can’t go to the extent of throwing blows but I can go verbally bad,” Setor said during a media interaction. There was however confusion over who really is Setor’s girlfriend with over 3 beautiful ladies coming up to say he is their boyfriend. Setor on the other hand remained silent on who was actually his girlfriend or not. Sarah on the other hand remained firm throughout the competition, enduring all the stunts by her car mates. She appeared to have had her own game plan to stay in the competition and eventually win the car. To get things heated a bit, the family of Sarah moved to the West Hills Mall to warn Setor about his persistent tormenting of Sarah. “If I have been courageous to live with them, I think the public has noticed it and they will help me to win. 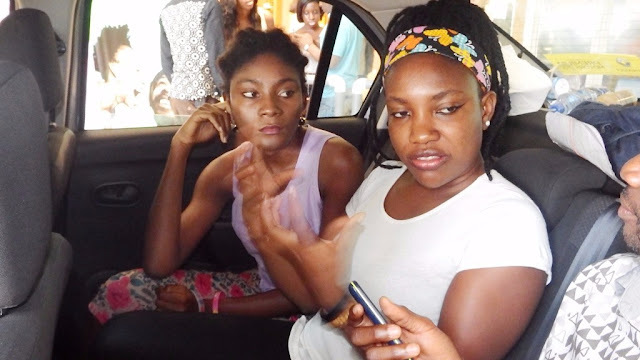 I have learned about time management, how to control temper, people with different attitude and those who want to stab you at the back,” Sarah shares her experience inside the car. Ernestina who always took some minutes from her breaks to privately smoke some sticks of cigarette said she misses her 8-year-old daughter. “I have found myself where they -Sarah and Setor- are before so being with them is like living with siblings. Trust me, it’s not been easy. I have missed my daughter so much and want to be with her,” Ernestina shares her challenge. 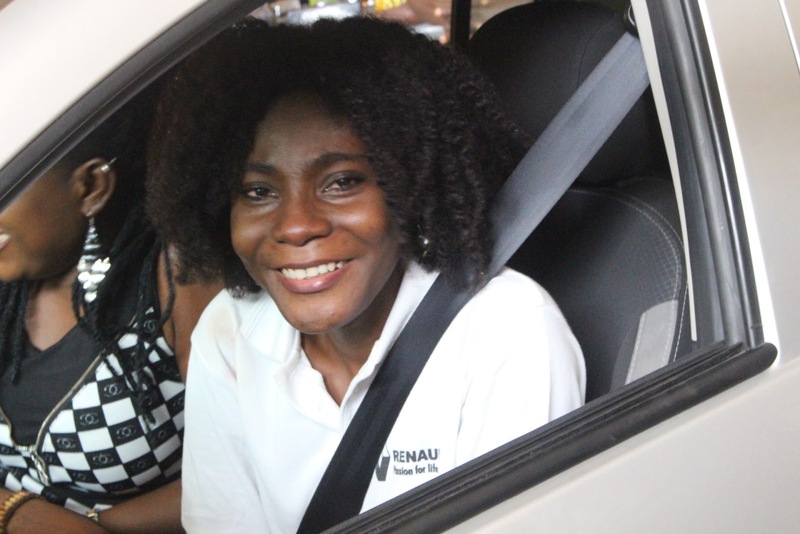 As the 40-day reality contest ended on April 15, Sarah Ayim (model), Sector Jinadu (model) and Ernestine Mawuse Fiah (Hairstylist) were the only contestants left to demonstrate their fortitude for the Renault Logan. Before the grand finale, Setor disclosed that he would use it to serve orphanage homes, Ernie would run her hairstyle business with it while Sarah would use it to run her ticketing agency. Patrons enjoyed with regular updates and live feed from the event on e.TV Ghana, YFM and Happy FM as well as on social media with the hashtag #liveinside.